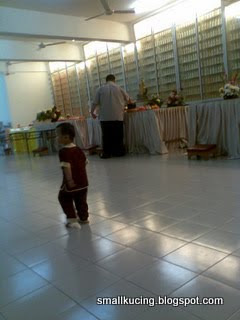 The 1st Day of CNY. 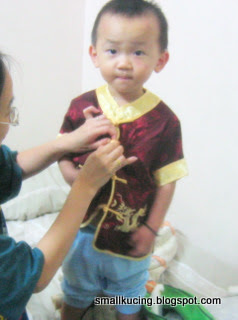 Woke up early.Mamarazzi help me to put on the nice CNY baju that Kaw Por bought for me last year. Nice leh. First stop of course to visit my Chor Chor. This is my Chor Chor new "home". Alamak! where is my Chor Chor? They stay at which "apartment"or "condominium". Huh..tak jumpa la. How ah? The famous Sate. 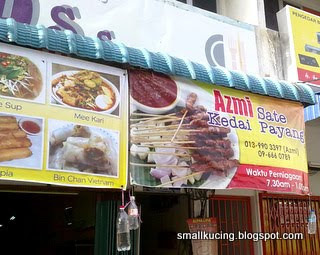 Funny how they eat sate for breakfast while in K.L we eat sate for supper or snack. 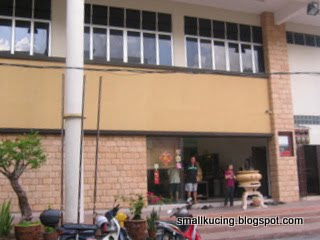 This famous sate shop which used to be situated at the row of shops opposite Pasar Payang have shifted to the row of shops opposite Mydin. This is because the old shops have been bulldozed to make way for progress. Mamarazzi said it taste very good. Not much of fat and the meat was tender and juicy. I taste okay okay aje. Guess, I have yet to learn to appreciate sate. 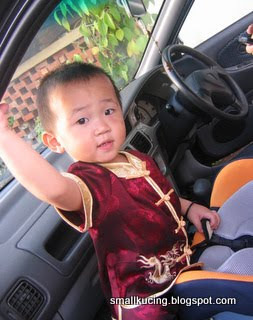 Chinese New Year kau tim...do check out the next post on how I gave Mamarazzi a "KISS" on Valentine Day. ok, i want to peep at the valentine kiss next! 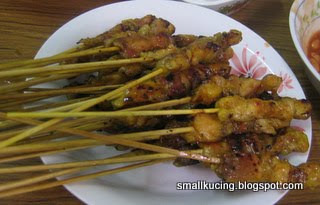 You take me go and eat sate - anytime also can! LOL!!! Wah! 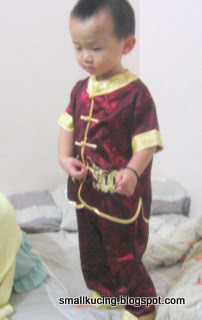 Kung Fu kid...so handsome in Chinese baju! Got girl fall in love or not? Hahahahaha! 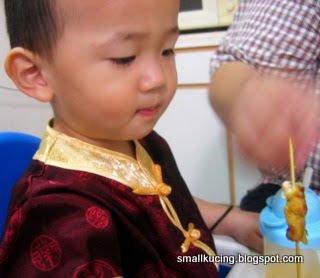 Having sate for 1st day Chinese New Year, that is special. I remembered my eldest nephew bought Kajang Sate at Dengkil Highway R&R area to bring back hometown in Melaka on 1st day of CNY too! Cheers..
Claire... Chor Chor means great grandma...issit great grandma? 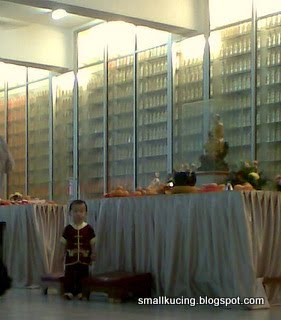 I am not sure, but I called my great grandma Chor Chor when I was a little girl... when she was still alive. I don't know what you call great granama in Cantonese and stuff, but I was from a baba and nyonya family. Usually our great grandmothers is called Chor Chor. Chor Chor is great Grandparent. Joshua says "You want a "KISS" from me? hehehe"
U love sate ah...okie next time u are in town we go for sate. first day CNY is no meat. I always eat satay kajang at jejantas, near the toll. 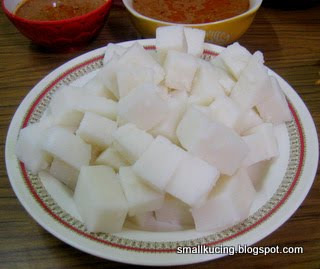 You go vegetarian on 1st day of CNY?